It's fairly obvious I have a thing for Mac & Cheese. Ever since I was a child & my mom would get out the blue box, it just made me happy. Confession... today the blue box still makes me happy. No judgment please. I found this recipe on Pinterest (where else?) from The Comfort of Cooking. 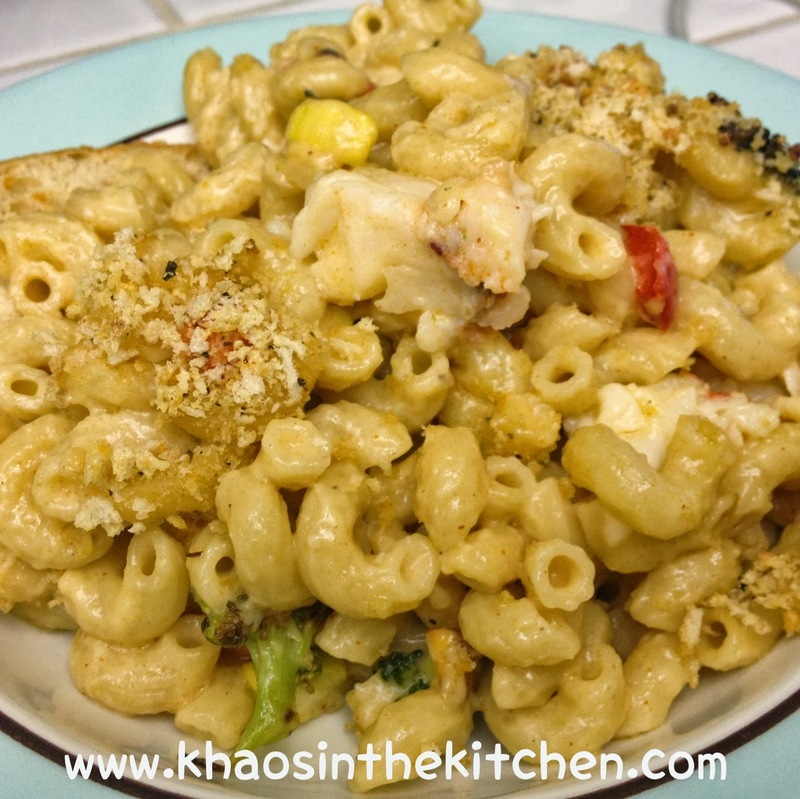 The original recipe is for a Roasted Veggie Mac & Cheese. 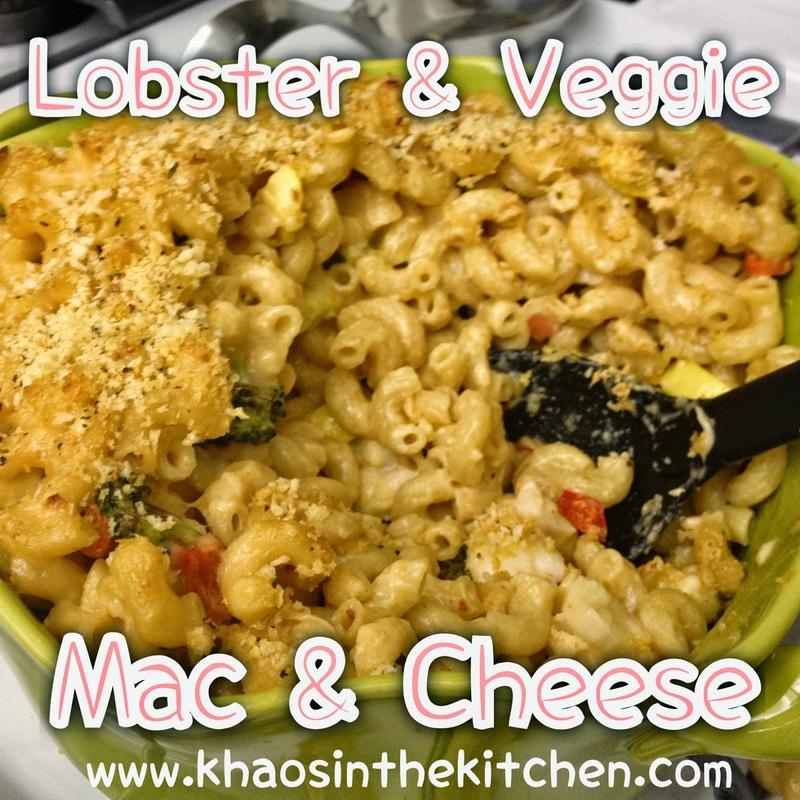 That in itself sounded good & I was intrigued about adding the veggies. But the more I thought about this recipe, I thought it needed one more thing. I toyed with the idea of adding shrimp or chicken, but then it came to me: LOBSTER. Now, what do I know about cooking lobster? Absolutely nothing except that I refuse to bring a live lobster into my house for me to cook. Nope, no way, not going to happen. After discussing this predicament with some coworkers, they told me Whole Foods will sell lobster out of the shell. Well, this solved my problem! Except I went to 3 Whole Foods & did NOT find any lobster out of its shell. What I did find though were lobster tails that they were willing to crack for me. Perfect! Let me tell you, minus goofing on the cheese (more on that later) this recipe was AWESOME. Even without the lobster, this was a fantastic recipe. Against my better judgment, I did use whole wheat pasta which I am usually opposed to (I like my carbs OK?) I really couldn't tell the difference. I think it was meant to be a side dish & without the lobster, that would work quite well. It has a good kick to it, but if you wanted more heat, it would taste great with a bit of hot sauce. I am definitely a fan of this recipe & can't wait to try more dishes from The County Cook! How difficult was this according to Rachel? It was a bit complicated, but worth the work! Line baking sheet with tinfoil & spray with cooking spray. Spread out pepper, carrots, squash & broccoli & bake for 17-20 mins. While veggies roast, bring large pot of water to boil & add pasta noodles. Cook acc to package. Drain & set aside. While noodles & veggies do their thing, it's time to tackle the lobster. You'll notice I brought in reinforcements. My arms are really not that hairy. Remove the lobster from the shell while keeping the piece body of meat in one piece. We turned to wikiHow to learn how to properly cook a lobster tail. They have 5 different ways, I chose using a skillet. Over medium heat using either a little oil or butter, place the lobster in the heated skillet. Cook each side for about 3 mins until the meat is no longer translucent. Once cooked, chop up into chunks & set aside. At this point, your veggies should be close to done. Once the are softened, remove from baking sheet & set aside. Turn up your oven to 500 degrees. Now comes the fun part; the sauce. In a large skillet, heat 3 tbsp oil over medium heat. Add garlic & heat for 30 seconds. Whisk in flour & cook for 1 minute. Slowly whisk in milk stirring constantly. Once mixture begins to thicken, remove from heat. I accidentally added 1/2 cup mozzarella. How does one accidentally add cheese that isn't part of the recipe? Well I was making another dish for breakfast that also required 2 cups of cheddar cheese & I knew ONE of the dishes required the moz. Guess what, it's NOT this dish. Once cheese is completely melted, add in the cayenne & pepper flakes. In the large pot that cooked your noodles, combine the veggies, cheese sauce & noodles. Mix well. Then stir in the lobster. Place mix in a greased baking dish. Place dish in the oven & broil for approx 5 mins until the top is golden brown. Be careful serving! Major party foul J. Big thanks to my awesome helpers.